Posted by Jon in Review, Takara, Transformers with 3 comments. Another mold I’m checking out for the first time! 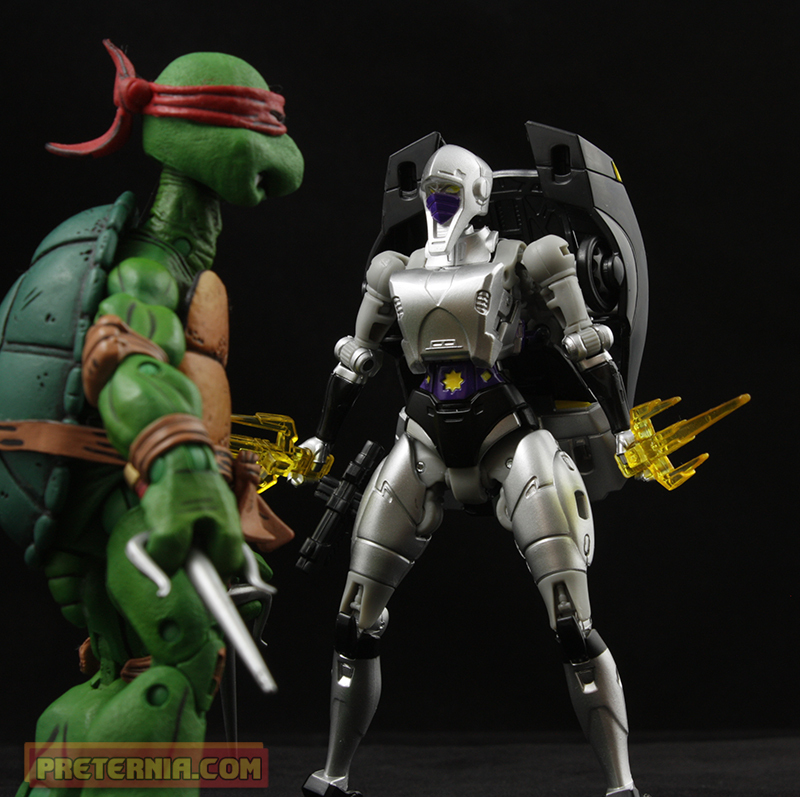 My second lady of the week, LG 15 Nightbird Shadow, makes her glorious appearance on the site and into my collection. 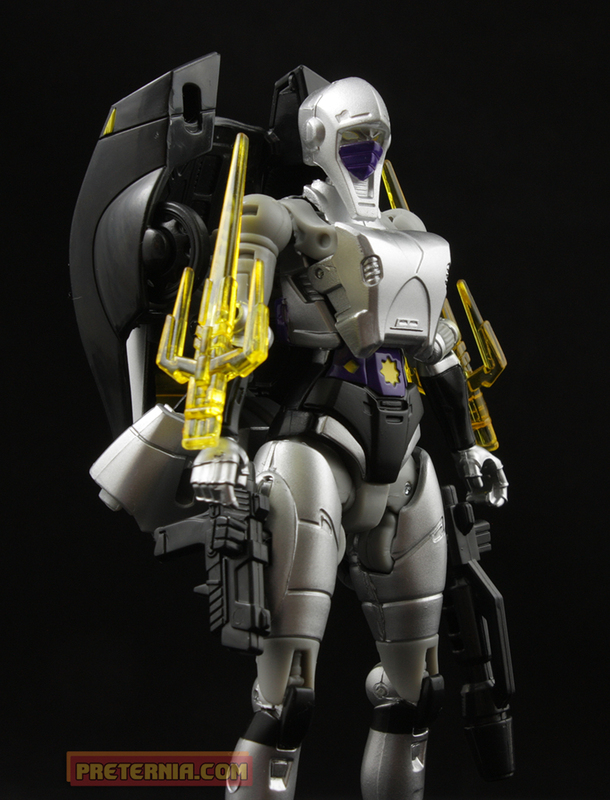 Similar to Slipstream, Nightbird is a repaint and retool of a generations figure, only this time its Arcee. The nice thing about Nightbird is that she is heartily accessorized. She comes packed with two sais, two swords, and two guns. If you want to, you can actually put every single item on her person so that no accessories need to go in the bin. It a bit excessive that way, but most collectors are excessive people so I wouldn’t put it past them. She has grooves cut into her forearms and upper legs for weapon storage. They also fit cleanly in her hands for the traditionalist. I really dig the melee weapons plugging into the arm, personally. I do wish she came with the drink tray they depict her holding in the comic/instruction book included with the figure! Not that her hands could actually hold the thing, but it would still be really cool. I need more robots with drink trays, unfortunately Trash-Talk is the only one I own thus far (and probably the only one that exists). The instructions that come with these Takara releases are incredible. I can’t read a damn thing, but I love that every character gets their own little spotlight comic. What I like most about Nightbird Shadow is the head sculpt and how it is supposed to resemble a hood or burka. It’s a really neat look and I think they captured it really well. This is a great mold with a surprising amount of articulation. The arms and elbows have a giant range of motion along with the hips and knees. If I had to fault her on anything it would be the tiny tiny feet. Thicker feet would be nice for one legged posing. She also doesn’t have a wrist swivel, but I can forgive that with all of the other articulation. Her transformation was simple and satisfying. It’s a nice break from the convoluted Mastermind Creations Azalea transformation. I never want to transform another MMC fem bot, it’s not fun. Nightbird may not be my favorite of the three new fem bots, but she’s still a great figure! She has a unique and menacing look about her. 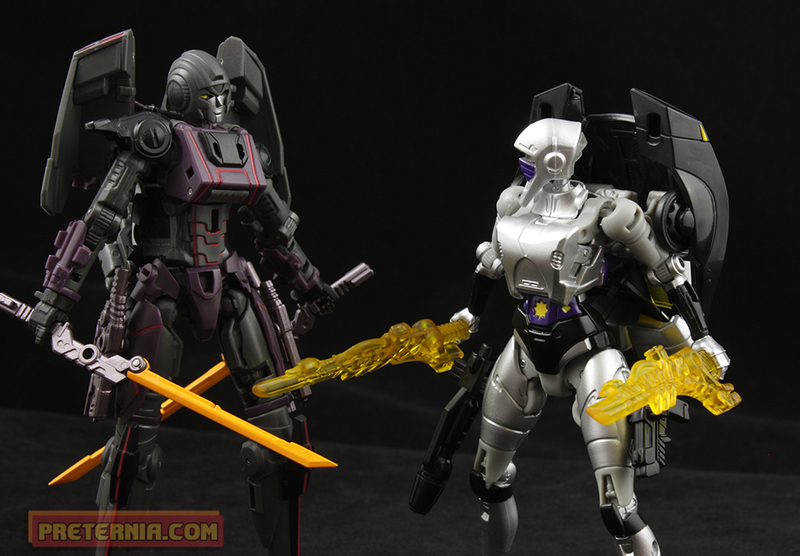 I also have a new found respect for the new Arcee mold … I may need to go back and get her at some point. We’ll see. I can’t overdose on Generations figures, they tend to multiply quickly on the shelf resulting in purges. Takara MP Grimlock has a drink tray as well. Nice review! 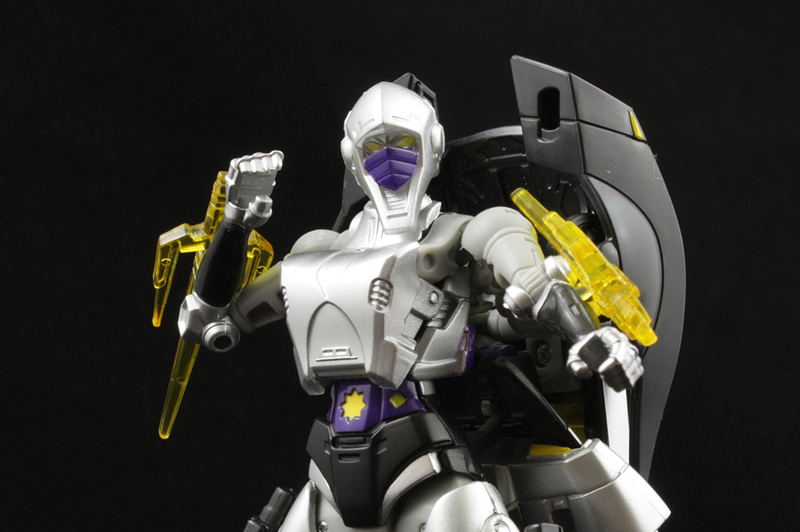 I never considering ever collecting any fembots, but Nightbird was always a little less “girly” in my eyes, being a ninja. I always said to my friends growing up that it would be an amazing toy, and it’s finally a reality.